In this article, Dr. Brian Culp and Dr. Hari Bezwada provide tips for surgeons transitioning from another approach to direct anterior approach total hip arthroplasty to help them avoid potential complications. Interest in the direct anterior approach (DAA) for total hip arthroplasty (THA) has increased significantly over the last decade. Surgeons’ familiarity with performing this approach, however, largely depends on their education and experiences, including which approaches they were taught in residency and fellowship and which approaches their practice partners favor. The goal of this article is to provide tips to surgeons transitioning from another approach to the DAA to help them avoid potential complications. When deciding to learn the DAA, surgeons must first be mindful that successful transition to this approach requires practice assessment and self-analysis. If case volume limits the frequency of use of this technique, surgeons will be less likely to gain the proper repetitions to utilize the DAA reliably. It has been suggested that a threshold for the initial learning curve is 50 cases. Furthermore, the availability of more than 1 surgical assistant, the desired type of operative bed, and equipment needed should be factored into the decision to make this change. Planning these factors in advance will minimize confusion on the day of surgery (Figure 1). Figure 1. Operating room setup for a direct anterior approach total hip arthroplasty. Implant choice may also facilitate an easier case. Straight stems often pose challenges when attempting to ream and prepare the femur. Femoral stems with a lower-profile shoulder allow surgeons easier access to component preparation and insertion in the difficult femoral portion of the case. Appropriate offset instrumentation is required and may not be immediately available unless ordered. The surgical rep can often provide the equipment. Patient selection during the early transition is also critical to safe learning and improved confidence with the approach. 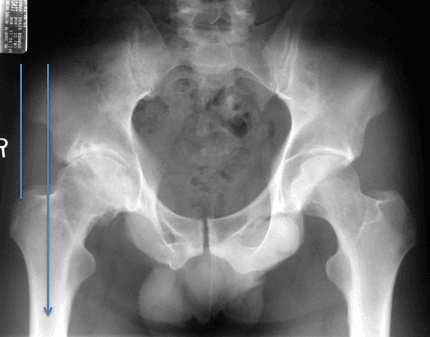 When assessing patients as possible candidates for DAA hip replacement, surgeons should pay particular attention to the patient’s body habitus, gender, and musculature. The ideal patient to start with is the thin, valgus neck female with soft, pliable muscles. Patients with a large abdomen should be avoided early in the transition to the DAA: They may pose certain challenges for exposure due to soft tissue interference, as well as difficulty with wound healing. Muscular males may have larger overlying structures, such as the rectus femoris, that may limit exposure or require additional release techniques. Radiographic features may also predict the difficulty of the procedure. Access to the femur may be more challenging in patients whose iliac wing width is greater than the trochanteric width (Figure 2). Figure 2. Evaluating iliac wing width versus trochanteric width in a candidate for direct anterior approach total hip arthroplasty. As with all surgical procedures, adequate exposure is the first step to working through difficult scenarios. Surgeons should not attempt small incisions when they first start using the DAA; smaller incisions can be used after they have more experience. Superior exposure may also be performed with a lateral limb of the incision at the iliac crest, creating a more classic extensile exposure. This may require either release of the tensor origin off the ilium or release of the rectus fiber off the acetabulum. Doing so can allow inline access to the femur, should use of a straight or diaphyseal stem be desired. 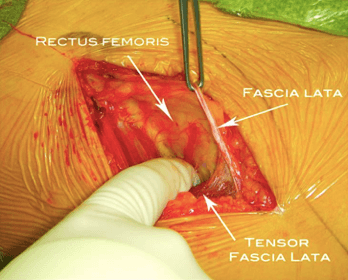 When passing deeper, the surgeon should also be mindful to mobilize the tensor fascia lata fully off the muscle fibers, being careful to identify the Smith-Peterson muscular interval rather than drift medial to the rectus muscle, which could cause damage (Figure 3). Figure 3. The tensor fascia lata must be fully mobilized off the muscle fibers. Exposure issues at the deep level tend to present the major challenge in the DAA procedure. This often starts with release of the femur. Adequate dissection of the pubofemoral ligament (medial capsule) is necessary to mobilize the femur. Surgeons should aim to dissect medially enough to access the lesser trochanter, doing so early in the case to allow for ease later. Dissection at the level of the greater trochanter, from the superior capsule to the posterior capsule and adjacent conjoined ligament complex, is necessary to safely mobilize the femur. This should also be done early in the case to allow the femur to fall away for acetabular preparation and to facilitate femur elevation out of the wound bed for femoral preparation. It may be easier to perform a capsulectomy than a capsulotomy when learning, even if the latter is the ultimate goal, to eliminate structures obstructing line of sight. Surgeons often go through an evolution in the amount of release, from under-releasing to over-releasing to eventually titrating releases as comfort with the procedure increases. Moving to more aggressive release early can facilitate the case and minimize complications in the learning curve. This strategy of skipping the under-release phase may eliminate some early intraoperative complications. When reaming the acetabulum, surgeons must keep in mind the direction in which the reamer might migrate. In the posterior approach, the femur can push the reamer posteriorly, risking reaming away the posterior acetabular wall. Anterior exposure leaves the femur deep to the acetabulum and may force the reamer to preferentially take away the anterior wall. Surgeons must be mindful of this to avoid allowing the femur to drive their hands up into the anterior column. The safe zone for screw placement also changes orientation with surgery from the front. With the posterior approach, screws are often placed in the posterior superior region. For the DAA, surgeons must visualize this quadrant in the front. A preoperative review of a text or image may help in this step. The transverse acetabular ligament is also a useful anatomic tool that appears different from the front  and can help surgeons avoid under- or over-anteverting the cup. Reviewing this structure’s appearance and location before a case is a good plan. Positioning the patient with preoperative pelvic tilt can also affect cup placement. 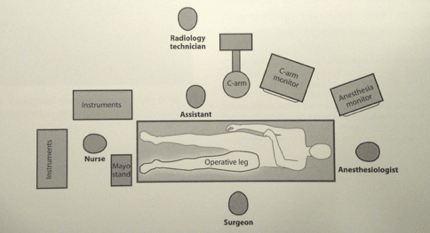 Surgeons often use the floor as a reference for the horizontal axis to determine anteversion (Figure 4). The cup may be placed in less-than-desirable anteversion if the pelvis is extended. Radiographs during surgery can account for this by matching the obturator rings to the preoperative radiographs on standing films. Figure 4. Positioning the patient with preoperative pelvic tilt can affect cup placement. Lateral perforation and trochanteric fracture are the 2 greatest risks with femoral preparation. A standard box osteotome may be too aggressive on the shoulder of the trochanter, especially as it is being impacted in a direction aimed toward the floor. This can result in trochanteric fracture. Being less aggressive with this tool, and utilizing a curved starter, rongeur, or awl, may help gain canal access without damaging the trochanter (Figure 5). It is important to remember that as each femoral instrument is utilized, the skin and anterior musculature tend to drive the angle of entry into a more vertical fashion, which can cause perforation or fracture of the femur. Figure 5. 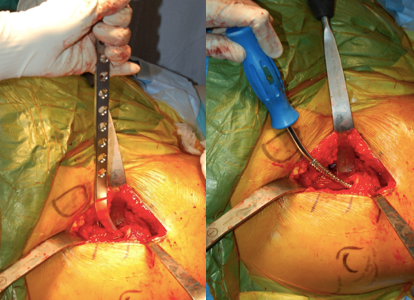 Use of a curved starter (left) or awl (right) may help the surgeon gain canal access without damaging the trochanter. Determining femoral anteversion can also be confusing for new adopters of the DAA. Matching the femoral stem to the posterior calcar is a good surgical cue for correct placement. Lastly, reduction maneuvers are important for assessing trials. Surgeon without access to a specialized table may be able to utilize the table rep to help with these maneuvers, or a skilled second assistant may be able to pull traction on the draped leg. In either circumstance, surgeons should pay close attention to the femoral head trials to ensure they remain on the neck and are not lost into the pelvis. Using heads that have a secure fit to the trunion or, alternatively, passing a suture loop around the trial head can help avoid this simple but serious mistake. Preparation and exposure remain the cornerstones of good surgery. Skilled surgeons can focus on avoiding errors when they are thorough in preparation and with trial runs, have skilled representatives managing equipment, and are working with informed surgical team members. Being more generous with exposures, both at the skin level and in capsular releases, can make the early phases of learning the DAA much smoother. Ultimately, with repetition and a good plan, surgeons can become very comfortable with the DAA, enjoying excellent, reproducible results for their patients. Brian M. Culp, MD, and Hari P. Bezwada, MD, are from University Medical Center of Princeton-Penn Medicine in Princeton, New Jersey. Dr. Culp has no disclosures relevant to this article. Dr. Bezwada has disclosed that he is a consultant and educator for DJO Surgical, Corentec, and Flexion Therapeutics. de Steiger RN, Lorimer M, Solomon M. What is the learning curve for the anterior approach for total hip arthroplasty? Clin Orthop Relat Res. 2015;473(12):3860-6. Nogler M, Krismer M, Hozack WJ, Merritt P, Rachbauer F, Mayr E. A double offset broach handle for preparation of the femoral cavity in minimally invasive direct anterior total hip arthroplasty. J Arthroplasty. 2006;21(8):1206-8. Purcell RL, Parks NL, Gargiulo JM, Hamilton WG. Severely obese patients have a higher risk of infection after direct anterior approach total hip arthroplasty. J Arthroplasty. 2016;31(9 Suppl):162-5. Grob K, Monahan R, Gilbey H, Yap F, Filgueira L, Kuster M. Distal extension of the direct anterior approach to the hip poses risk to neurovascular structures: an anatomical study. J Bone Joint Surg Am. 2015;97(2):126-32. 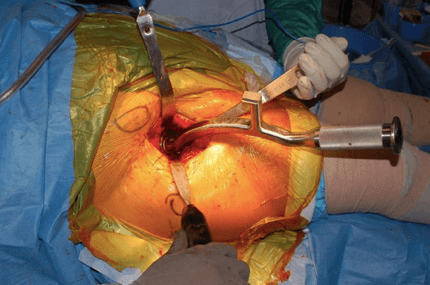 Molenaers B, Driesen R, Molenaers G, Corten K. The direct anterior approach for complex primary total hip arthroplasty: the extensile acetabular approach on a regular operating room table. J Arthroplasty. 2017;32(5):1553-9. Matsuura M, Ohashi H, Okamoto Y, Inori F, Okajima Y. Elevation of the femur in THA through a direct anterior approach: cadaver and clinical studies. Clin Orthop Relat Res. 2010;468(12):3201-6. Wasielewski RC, Cooperstein LA, Kruger MP, Rubash HE. Acetabular anatomy and the transacetabular fixation of screws in total hip arthroplasty. J Bone Joint Surg Am. 1990;72(4):501-8. Archbold HA, Mockford B, Molloy D, McConway J, Ogonda L, Beverland D. The transverse acetabular ligament: an aid to orientation of the acetabular component during primary total hip replacement: a preliminary study of 1000 cases investigating postoperative stability. J Bone Joint Surg Br. 2006;88(7):883-6.